Mǫwhì’s father, Ewaàghoa, was the first person to build a house at Behchokǫ̀. In the past, Tłı̨chǫ used to live at Nı˛hshìì (Old Fort Rae), an area on the shores of Great Slave Lake. There remain many gravesites and old houses at Old Fort Rae. Because of the challenges of travelling on Great Slave Lake, many Tłı̨chǫ people decided to move to Behchokǫ̀ because it is good area for fish. It was kweèka (a rocky place), making it a good landscape to build houses. Ewaàghoa once said that there used to be so many people at Behchokǫ̀ that the whole Gamę Dıì (the present day Bay Island) looked like a white island because of the many white tents set up for people to live in. Behchokǫ̀ is the largest of the Tłıc̨ hǫ communities, with approximately 1,950 people, located 105 km northwest of Yellowknife, close to the North Arm of Great Slave Lake. Behchokǫ̀ means ‘Big Knife’. 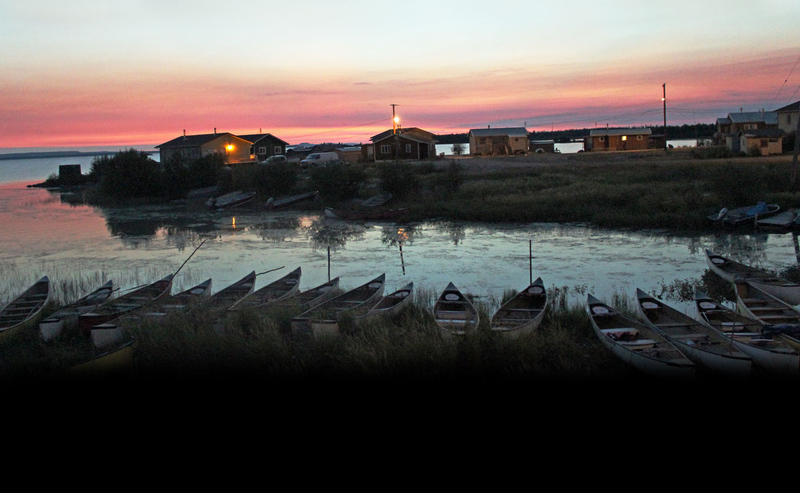 It is the only Tłıc̨hǫ community that is accessible by an all-season access road. Behchokǫ̀ consists of two communities – the original community of Rae is the larger of the two and home to the Tłıc̨hǫ Government offices, Community Government offices and Tłıc̨hǫ Community Services Agency (TCSA) offices. The development of Edzo began in the 1960s. Edzo was a great Tłıc̨hǫ leader who arranged peace between the Tłıc̨hǫ and the Yellowknives. Edzo is the home of Chief Jimmy Bruneau High School.